Gosh, here is the prisoner being subdued on the outside of a temple once again. This time under the watchful eye of Horus. 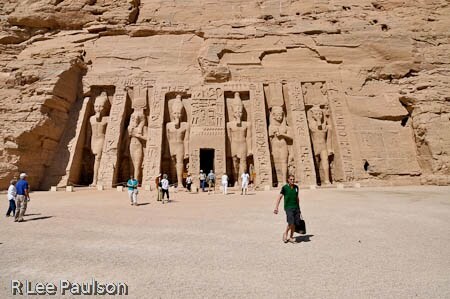 I, for one, was not willing to endure 6 hours in a cramped bus for a 90 minute peek at Abu Simbel, either. 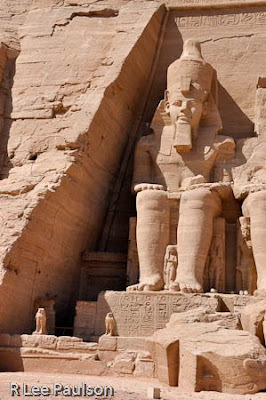 It wasn't worth it even if everyone did say that Abu Simbel was one of the architectural jewels of Egypt. 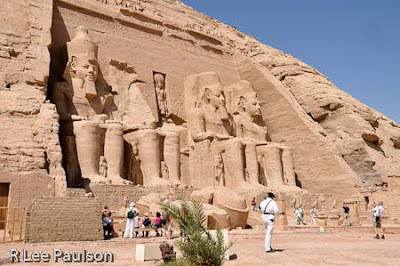 The short version of a long story is that, because there were only five of us, we gave John the day off, purchased our own tickets and flew there on Egypt Air--and ended up paying only $76 each plus cab fare to and from the airport. 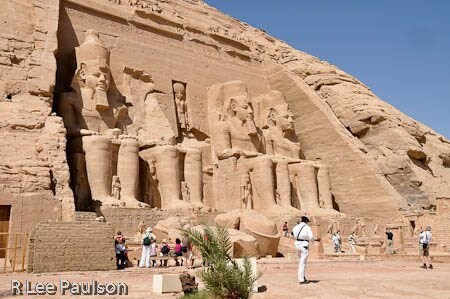 Abu Simbel is literally built into a mountain side. I could take a million pictures but you just need to go and see it for yourself. See how small the people are compared to the statues on the outside? Amazing. It worked great. The plane landed during a time between the convoys. There were 300 people on the small Airbus. Part of the ticket price included a bus to and from the airport to Abu Simbel. Most of the other 300 people marched into the temple, took a quick look around, then removed themselves to the local bazaar, giving us the entire place nearly to ourselves. It was divine. 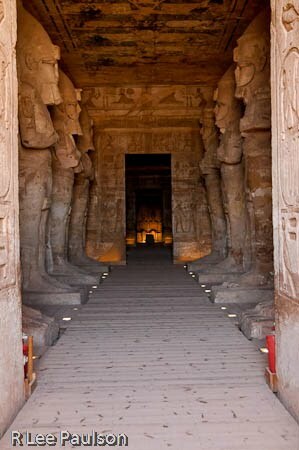 If you ever make it to Egypt, be sure to come here. This was one of my favorite days of the entire trip. The little hawk on the lower right is another form of Horus. 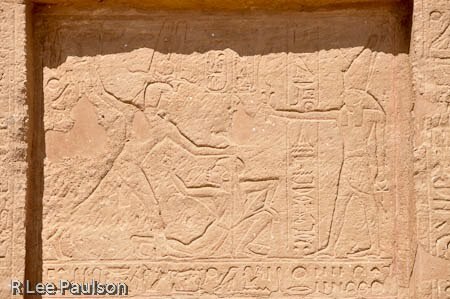 The large male figures are Ramesses. (are we surprised?) The smaller female figures represent his wives and daughters. 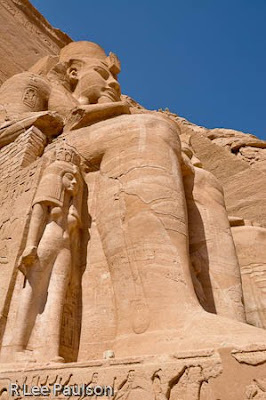 They are smaller than Ramesses, certainly, but still larger than life sized. Ticket takers standing by the entrance. I found out when it was nearly time to go that I could have bribed them with Baksheesh and been allowed to take some photos inside. 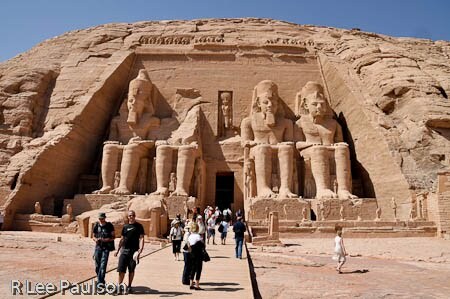 Notice the door key shaped like an ankh, behind them. With only 5 minutes to go before the bus left, I did manage to bribe them for one interior shot with me standing at the doorway. The interior rooms were intimate with reliefs that still had much of the original paint still intact. They were beautiful. On April 22 and October 22, the king's birth and coronation days, the rising sun shines straight down this hallway 180 feet and illuminates the statues sitting against the back wall, which one can barely make out in the shot above. 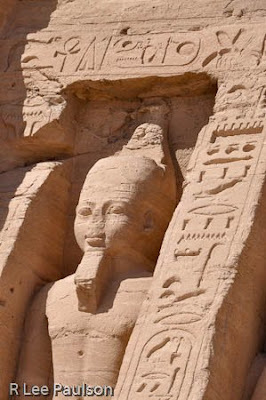 Immediately to the right of this is another temple dedicated to Ramesses's wife, Nefertari. It is smaller but very nice inside as well. I don't know if this is an accurate likeness of her or not. I turned as I walked to the second, smaller temple, and saw this family posing for pictures. 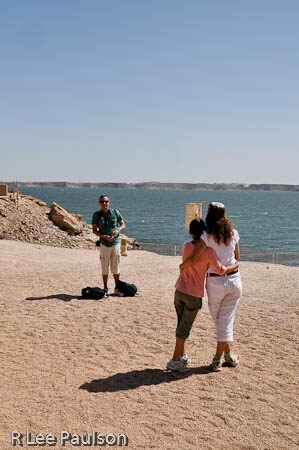 This site, as you can see, is right on the bank of the Nile. It is a fabulous setting, maybe not quite so fabulous as when this temple was built in prehistory, but worth a visit just the same. Continue on to Post 38: Aswan by clicking here.